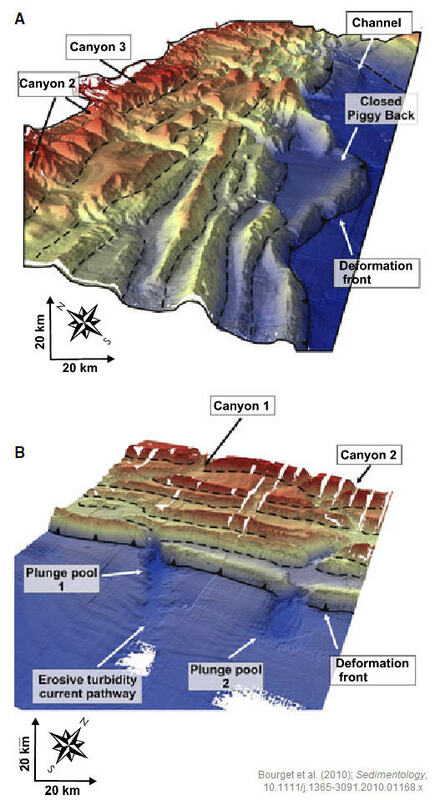 This week’s Sea-Floor Sunday image is from a recent paper in Sedimentology by Bourget et al. 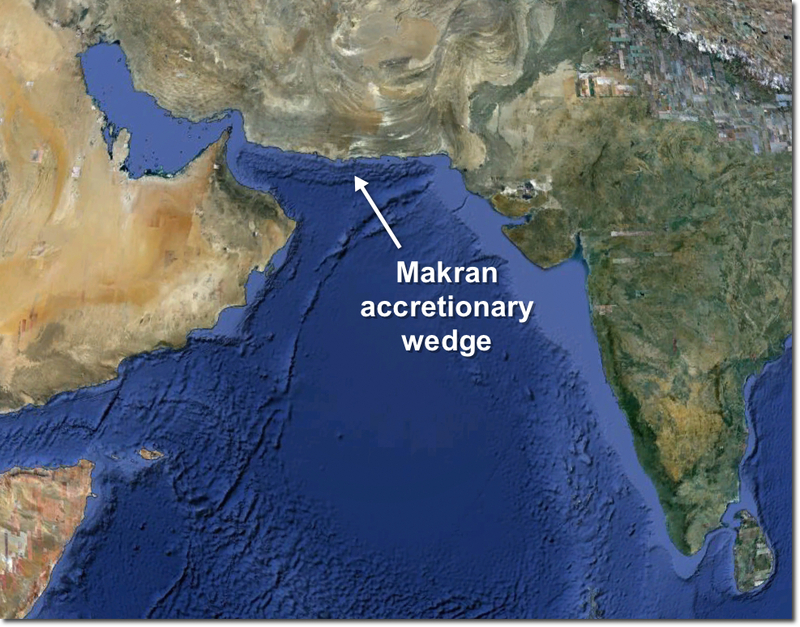 that investigates the deep-marine sedimentary system associated with the Makran subduction zone and accretionary wedge in the northwest Indian Ocean (offshore of Iran and Pakistan). The Arabian plate is subducting northward underneath continental blocks now part of the Eurasian plate creating a wide swath of compressional deformation. The images below (Fig. 8 from their paper) are perspective images of seafloor topography (bathymetry) where the warm colors are shallow water and the cool colors are deeper water. The shallowest part shown is a few hundred meters below sea level and the deepest, at the deformation front, is approximately 2,500 meters below sea level. Note the strong east-west trend in the ridges and valleys of the deformed zone. These images remind me a lot of similar perspective bathymetric images of the Cascadia accretionary wedge offshore Oregon and Washington. In this paper, Bourget et al. investigate the character of the turbidite systems that traverse this topographically complex continental slope. Submarine canyons and channels zig-zag their way down through this maze depositing sediment in the elongate basins behind uplifted ridges, commonly referred to as “piggy-back basins”. The patterns of sedimentation differ along the margin as a function of varying tectonic styles/rates and onshore sediment-feeder systems. Check out the paper if you want to learn more. Here’s a snapshot from Google Earth showing the regional context for this area. The first author of this paper, Julien, has commented on this blog in the past so I’m sure he’ll be happy to share more information — feel free to ask questions in the comment thread below.